BOOK A III COACH TODAY! 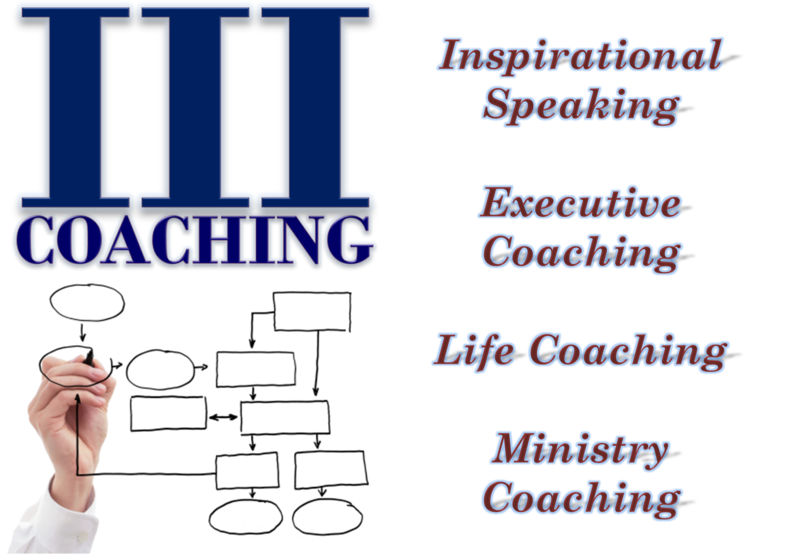 SUMMARY: III (Triple I) Coaching, LLC is a coaching firm that informs, instructs and inspires people and organizations to fulfill their purpose through various outlets. MISSION: To inform, instruct and inspire people and organizations to fulfill their purpose. METHOD: III Coaches inform, instruct and inspire people and organizations through conferences, seminars, workshops, and various media outlets. MEMBERSHIP: If you are a gifted communicator or ministry leader looking to use your gifts to inform, instruct and inspire, join us as a III Coach. FOCUS: To equip and empower people and organizations to serve their purpose while providing a platform for men and women to use their gifts to build others up. LIFE COACHING – inform, instruct and inspire individuals through providing specific life coaching to that assists them in fulfilling their purpose. Personal Life Coaching – assisting an individual through developing and implementing a strategic plan to accomplish a life goal. Spiritual Life Coaching – assisting an individual through developing and implementing a strategic plan for spiritual growth in a specific area. Life Purpose Coaching – assisting an individual in discovering and living out their life purpose including personal identity development assessments. We will also assist in connecting them to volunteer and job opportunities connected to their purpose. Leadership Life Coaching – assisting a leader in developing and implementing a strategic plan to improve their personal leadership and the growth of the organization they lead. Education Life Coaching – assisting an individual in developing and implementing a strategic plan to accomplish their education goals including grade improvement, college entrance or continuing education. MINISTRY COACHING – inform, instruct and inspire ministries to fulfill their purpose through being more effective and efficient in their kingdom service. Leadership Development – assisting in developing a strategic plan for selecting and developing ministry leaders that can cast vision, implement the mission of the church and reproduce themselves. Discipleship Ministry – assisting a discipleship ministry in developing a strategic plan for moving members from spiritual infancy to spiritual maturity including personal discipleship and corporate discipleship. Areas of focus will include strategic teaching, small group development, discipleship institutes and web-based discipleship. Adult Ministries – assisting an adult ministry in developing a strategic plan for launching and developing a ministry with a mission statement, vision, goals, objectives and leadership development plans. Marriage Ministry – assisting a marriage ministry in developing and implementing a strategic plan to prepare couples for marriage and enhance current marriages. Singles Ministry – assisting a singles ministry in developing and implementing a strategic plan to meet the needs of singles of all life stages including never married, divorced and widowed. College Ministry – assisting a college ministry in developing and implementing a strategic plan to effectively minister to the needs of college students on local college campuses while developing future leaders for the local church. INSPIRATIONAL SPEAKING – inform, instruct and inspire individuals and groups to presentations that provide inspiration to move towards their purpose. Corporate – inspiring corporations to assess and make the adjustments needed to move their company next level in their market. Educational – inspiring students in elementary, middle, high school and college campuses to develop and execute a vision for their lives including education and experiences. Spiritual – inspiring your group to embrace the direction that God is moving by riding the wave he is on. Relational – inspiring people in your organization to better understand their relationships including effective communication, conflict resolution and relationship building. Comedy – providing comedy relief and entertainment to your group through using humor to share life principles from everyday life situations. MENTORING – inform, instruct and inspire the next generation through strategic mentoring relationships in partnership with local elementary, middle and high schools to prepare students for college and life after college. III Boys – Men mentoring boys – recruiting and connecting men who mentor boys in their local school district. III Girls – Women mentoring girls – recruiting and connecting women who mentor girls in their local school district. III Scholarships – Raise money to provide scholarships to students who have been mentored by III Mentors. III Marriages – Marriage Mentoring – recruiting and connecting effective marriage couples with other married and dating couples to provide relationship mentoring that prepares couples for marriage and allows current couples to enhance their marriages. BOOK PUBLISHING – inform, instruct and inspire people through written resources that assist them in better understanding fulfilling their purpose. Books – writing books that inform, instruct, and inspire people to fulfill their purpose. Magazine Articles – writing magazine articles that inform, instruct, and inspire people to fulfill their purpose.